Panasonic's Attune II digital drive-thru system has unmatched sound quality, reduces order errors, and eliminates the need to reconfirm an order. 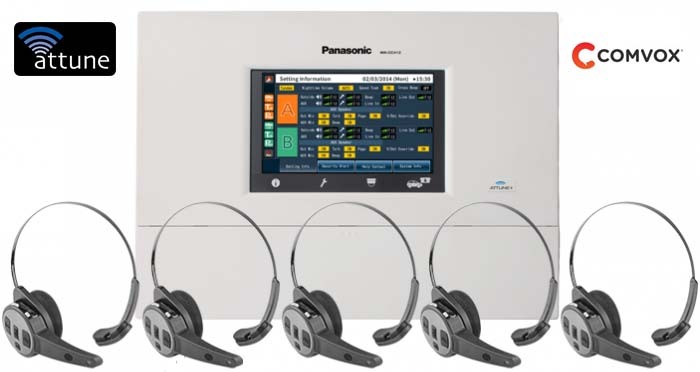 The system includes increased Digital Noise Reduction (DNR) that can remove both constant and fluctuating noise, improved echo cancellation and volume control. While many conventional digital drive-thru order-taking systems operate on the unrestricted 2.4 GHz band and are subject to interference from other devices, Attune II operates on the restricted 1.9 GHz band with a new DECT repeater. This provides for clear, reliable, interference-free communication with an increased range and eliminates bulky antennas. Additionally, no FCC licenses are required for operation. Advanced DNR (digital noise reduction) technology employs a 3-microphone array to capture and cancel unwanted ambient noise such as refrigerators and microwaves, and burst noises such as ice scooping and buzzers. It also blocks heavier background noises, such as traffic, trains and planes. One of the lightest headsets in the industry, the new Attune II HD3 is easy to wear and easy to use. With a simplified user interface and cable-less headband, your employees will be comfortable wearing it even longer. And, with specially-designed tactile touch buttons, employees can be certain when their audio is on. So the possibility of an accidental microphone snafu is eliminated. PanasonicOrder.com is operated by Comvox Systems LLC, an authorized Panasonic Reseller; Panasonic Prime Partner. This site is not operated or associated with Panasonic Corporation of North America. All Trademarks are the property of their respective owners. Prices and programs are subject to change without advanced notice.